HOME > DASHBOARD AREA > How can I check my Revenue Dashboard? STEP 1: Click on the DASHBOARD tab. The Revenue Dashboard allows the hotel to review their Revenue performance by Month or Year. Date range will include check-in/check-out dates within the selected period on the calendar, which means that it only includes the value for the nights inside the selected period. By default the option "All channels" is selected but when clicking on it, the dropbox will show all the channels either if they are active at the time or not. You only need to have one reservation made in the channel. The pie chart will only show the top 5 channels. 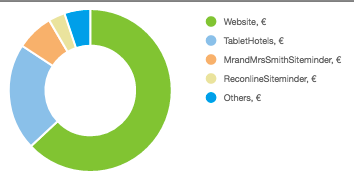 If there are more than 5 channels the pie chart will show "others" (sum of the remaining channels) as a channel. 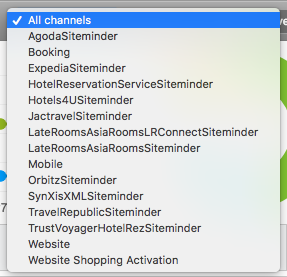 When selecting a channel, "Website" for example, every data displaying on the board is only regarding that channel. This report does not include bookings with status: CANCELLED / DELETED / INQUIRY / ACTION NEEDED . You can also export the report results to excel, by clicking on the relevant button at the top right corner of the report .